Here’s a 1975 interview with Eric Dolphy’s parents, Eric Sr and Sadie Dolphy. The interviewer is Alan Saul and he explains the circumstances of his meeting with the Dolphys on his website. The video is a nice document of these warm and supportive parents, their perspective on their son’s personality, his generosity, his commitment to his church, and his optimism. 12:30 Alan Saul: Do you have any ideas what he would advise people, or what advice he could possibly help people on? Mrs Dolphy: I think he’d tell them to practice, because that’s all he did (laughs). He would get up in the morning before he went to school, say about 4:30 or 5, and practice until it’s almost time to get his breakfast and leave for school. And he’d hurry home to start practicing again, until very late in the evening…. 13:19 Alan Saul: Did he mostly just practice scales and exercises? Mrs Dolphy: Yes, and tone quality. He’d blow one note all day long. Much more Dolphy info at Saul’s website. This entry was posted in alto saxophone, practicing on April 9, 2017 by jaybrandford. 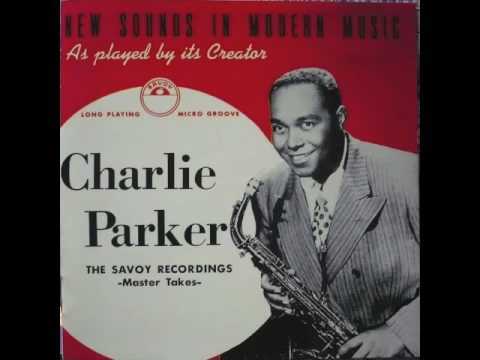 At his11/26/45 recording date for Savoy, his first session as a leader, Charlie Parker produced 3 of his best known and most influential solos, Now’s the Time, Billie’s Bounce, and Koko. These 3 recordings have challenged and inspired generations of alto saxophonists, and to learn these solos is an essential part of learning Bird’s language. That particular day in the studio was also the source of many folk tales, thanks to Teddy Rieg’s casual paperwork, Bird’s loose concept of leadership, and the haphazard research that used to be acceptable in jazz criticism and scholarship. The actual story of that day is fascinating (see here for more details) and much more music was recorded besides the 3 most famous tracks. Which brings us to Meandering. Several weeks ago a colleague – Marc Phanuef – played me a fragment of a gorgeous Bird solo that sounded like it might be on the changes of “Embraceable You.” Marc says the mystery snippet was used in the background during the Charlie Parker section of Ken Burns’ Jazz documentary. Where was the rest of this great track? After a little research we were surprised to discover that the recording was “Meandering” from the 11/26/45 session that we thought we already knew very well. In order to fully appreciate this solo we needed to hear it outside of it’s usual context as a ‘lesser’ outtake next to the monumental Koko, Now’s the Time, and Billie’s Bounce. Clearly it’s a wonderful full chorus of Bird at his heartfelt best; an artistic achievement well worth studying. Yes, the track is an out-take for good reasons. It’s apparently a loose rehearsal rather than a finished performance, and the changes that Dizzy is comping at the piano don’t always match the harmonies that Bird implies during his solo. (In the final turnaround in the last two measures of Birds’ chorus, Bird, Dizzy and bassist Curly Russell all go in different harmonic directions before landing together at the top of the next chorus.) And then there’s the brutal cut in the fourteenth measure of the piano solo – ouch! Hope you enjoy listening to it and playing it as much I do! This entry was posted in alto saxophone, solo transcription and tagged Charlie Parker, transcription on May 31, 2015 by jaybrandford. For a variety of reasons I’ve been playing the alto sax less often during the last year, so I decided to check out some master alto players for inspiration. 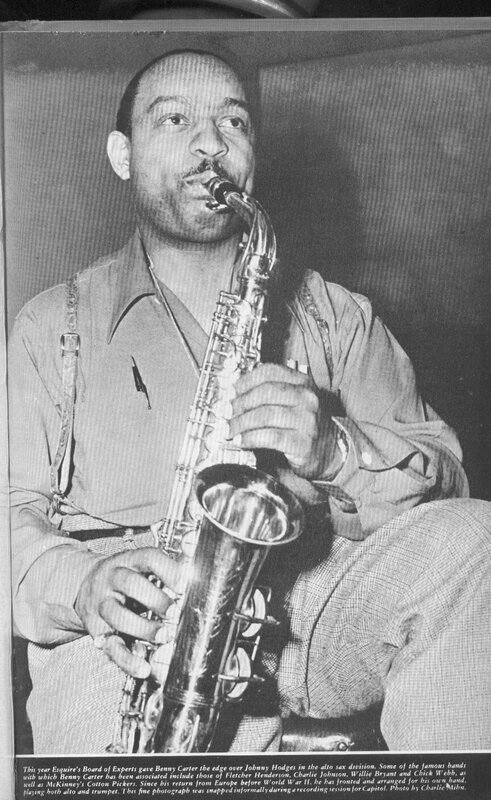 To start, here’s an outstanding performance by Benny Carter playing lead alto on the sax soli in his 1944 arrangement of “I Can’t Escape From You”. Here’s a transcription of his part to the sax soli chorus if you’d like to play along. The big band had been Carter’s full time project since 1940, and would continue as such for only another 2 years. Big bands have never been a stable business venture and the war years were especially hard on traveling groups. The band had been active on the West Coast since November of 1942 while Carter split his efforts between being a full time bandleader and starting a career writing for Hollywood. 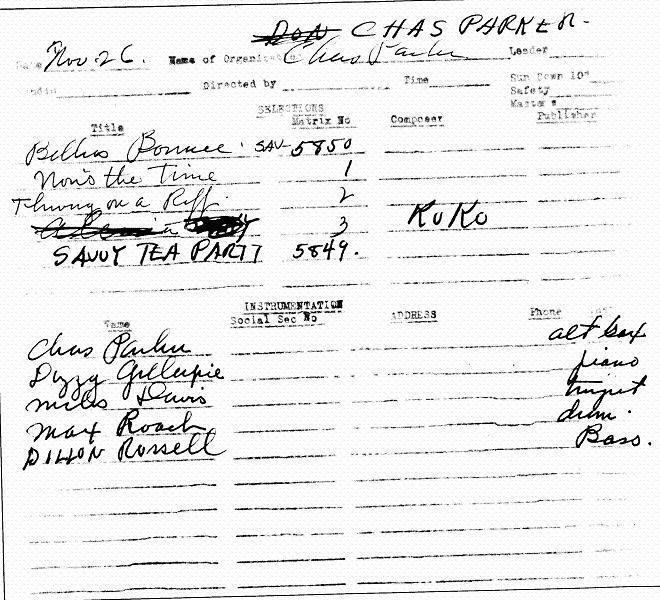 At this May 1944 recording session for Capitol Records he’s at the top of his game. This composition by Leo Robin and Richard A. Whiting, was in the air as pop song since Bing Crosby sang it in the 1936 movie “Rhythm On the Range”. Artie Shaw, Dexter Gordon, Errol Garner and others recorded the tune; check out Carmen McRea’s 1957 version if you’d like to hear a great jazz version of the lyrics. Carter’s arrangement starts with an intro that slides from Eb to Gb and back in 6 wild measures. He fits so much harmonic interest under the lyrical lead melodies in such a short intro! Next, unison trombones start the statement of the main melody. Rather than proceed in the usual fashion through the form of the tune Carter only gives us the first half, with a 4 measure interlude vamp where we would expect to hear the bridge. The interlude sets up a fantastic chorus harmonized for 6 saxophones, with Carter’s lead on top of the 5 man section. This sax soli is a great example of Carter’s superb alto playing, his state-of-the-art arranging skills, and first class team work from his sax section. If you’re playing along with the recording try to emulate his finesse and the ease with which he plays the dynamics and articulations that make this performance come alive. I didn’t notate all of the articulations; listen to the recording and match what you hear. After the sax soli, the chart modulates to Ab for a classy ensemble chorus with solo spots for Carter and pianist Gerald Wiggins. Then a short coda and done. This entry was posted in alto saxophone and tagged Benny Carter, transcription on March 19, 2015 by jaybrandford.